Here’s a classic from Deltoid who is trying to debunk Senator Fielding. 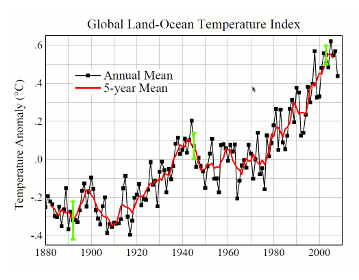 Fielding mentions that temperatures haven’t gone up in the last 15 years, and Lambert tries to mock him: “Clearly there was never any chance of convincing someone who can look at a graph like this one and not see any increase in temperature since the mid 90s”. Lambert appears to be having trouble reading the scales (time for bifocals Tim?) and the graph he shows starts 110 years before the era he is referring too. What kind of debunking is this? Look out Fielding, if you were as blind as me, you’d see how wrong you are? Devastating. Lets show you a close up of how Lambert’s graph supports his view of the trend from mid nineties to now… (Just trying to help Tim). As always, the clarity, the data are just top notch from those who want your money. Note that it uses GISS Data too. So any slight uptrend correlates with increases in car-park warming and air conditioner use. And before anyone accuses me of ‘ignoring the long term trend’, can I mention Akasufo? Yes please, lets use that graph from 1880-2009, in fact, lets use one from the depths of the little ice, or the depths of the big ice age. There is no timespan that I won’t talk about, because they all help the skeptic case.